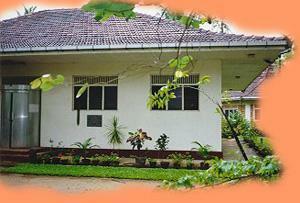 The Meditation Institute is in a serene atmosphere within the same block of land. It is surely a marvellous place to quieten one's mind. This Institute was built as a gift from Japan on 20th of January 1989. The building( main meditation hall) is a donation from Rev. Dr. Niva Rempo, the Incumbent of Eheiji Temple, Soko Sen Sect, Japan. This meditation hall is also a properly built Simamalaka (a place for monks to get together and recite and perform their other Vinaya activities such as ordination Higher Ordination and Uposatha Kamma). People of the area come to this meditation hall to meditate and get instructions. This is a very famous place. The hall is open from 7.00 am. to 10.30 p.m. Anyone can come and meditate here without any payment or disturbance. The Bhikkhu-in-charge of the Institute is Ven. Bhikkhu Amarasiri. He is a retired English Teacher, a practising Bhikkhu. As the atmosphere is so pleasant one can easily tranquillise one's mind. In this Institution mainly Satipatthana Meditation is practised focusing on the word of the Buddha. Publishing booklets both in Sinhala and English. We have published many booklets on various topics for free distribution such as the Buddha, The Buddha Dhamma, Relief, Source of Conflicts, Five Aggregates, The Four Noble Truths, Anapanasati , Tisarana, etc.etc. If you also would like to help us for this purpose, your donations are welcome. The world is full of worry and despair. It is a consolation to be free from such unpalatable experience. Both, relief and despair are self made. One is responsible for all one's activities. All gloomy situations are self made, so is relief from them. We present some lines for you to follow towards achieving relief in your day to day life. It is generally accepted that good health and economic stability are very essential for peace of mind. But most of those who have both are discontented and disappointed. Let one not observe the faults of others, nor what others have done and not done. Let one observe one's own actions and non-actions. Do not poke into affairs of others and thereby take into your palm the burning charcoal. Mind your own, if you expect solace in life. The world is governed by rules of natural justice. No one has a right to interfere with them. Be away from such involvements, you will have relief. He abused me, mistreated me, defeated me, robbed me. Who harbour such thoughts keeps hatred alive. Those who do not harbour such thoughts, banish hatred for all times and enjoy peace of mind. Hatred is never appeased by hatred in this world. It is appeased only by non hatred. This is the Eternal Law. Loving Kindness is capable of conquering the whole world. We are all destined to die in this world. I we remember this there would be no clashes in the world. Every conditioned thing ends up in dissolution. The others may be wrong but you need not get desperate about it. If you act so there is relief. Do not harbour enmity. It dissolves your heart. It is a poisonous snake. A fire that burns your self. It makes you sleepless and poison your blood and lead to heart diseases. It weakens your nerves. What benefit is there from enmity in this short span of life. A wound is not healed by making another wound. Happily indeed we live, friendly amidst the hostile. Amidst hostile men swell free from hatred. It is more dangerous to harbour anger than to show it openly. If you do so it will be like a cancer in your mind. Do not get agitated. Face situations calmly. You will enjoy relief. Victory begets an enemy; the defeated dwell in pain. Happily the peaceful live, discarding both victory and defeat. There is no fire like lust no evil like hatred. There is no ill like the aggregates (of existence) and no bliss higher than the peace (of Nibbana). Health is the precious gain and contentment the greatest wealth. A trust worthy person is the best relative. Deliverance is the highest bliss. Do not aspire for worldly recognition and glory. This is the surest way to mental and physical relief. Do not crave for recognition by others.Don't uphold majority recognition. The world is full of fools. Why seek to be king among fools. It is better to die as an unrecognized intellect. Most people who have risen to the top are not wise people. So do not take recognition as the criteria of greatness. Public opinion is not always right. Avoid attachment to both what is pleasant and what is unpleasant. Losing the pleasant causes grief, acquainting the unpleasant also comes to grief. So hold nothing dear. To one who is entirely free from endearment, there is no sorrow or fear. Sorrow and fear springs from affection. It springs from indulgence in sensual pleasures. Whoever is free from them knows neither sorrow nor fear. From lust and craving springs fear and grief. To one who is free from them there is no grief, whence fear. They blame those who remain silent: they blame those who speak much: they blame him who speaks in moderation. There is no one in this world who free from blame. There never was, there never will be, no is there now a person who is wholly blamed or wholly praised. The wise are controlled in bodily action, controlled in speech, and controlled in thought. They are truly well controlled. Envy is an affliction which impurifies the mind. Do not suspect any one. You may well be wrong. No one can change the course of your Kamma (Action). Only you can change it. We are all heirs of our Kamma. Kamma is the womb from which we are born. Kamma is our friend, our refuge. What ever Kamma we perform good or bad, there of we will be the heirs. Although each ones life may depend on the company and support of others they cannot change the course of our Kamma. If you undergo any affliction due to your environment you cannot change the environment. So adjust yourself to suit the surroundings. Be self purified. Be peerless and noble and calm. Your environment will automatically change with time. Learn to bear up incurable diseases. Sweet are the uses of adversity. Even though life is toilsome try to tolerate and face everything with equanimity. The patience your develop will win over all others in the end. Do not depend on others for help. It will always end up in despair. It will only enhance mental stress. Always depend on your own power and strength. There is nothing that a developed self effort cannot perform. To one who keeps on increasing his effort, more avenues will come up for his own benefit. So try to do as much of your work by your self. Whether the others help you or not, never fail to help them. But do not expect anything inreturn. Never neglect your responsibilities. It will never bring you consolation. One may have to repent a whole life for just neglecting a single responsibility. It will be a gloomy shadow for ever. Remember this well. Do not shoulder a weight that is too much for you. Undertake only the portion that you can do by yourself. If you do, it will only damage your effort and the good will of others. Gradually get relieved of outside responsibilities. Be of simple livelihood and controlled in your senses. Do not get attached to all that you see and hear. If you intend to get mental relief, don't stress the mind with sensual activities. The mind is only the thoughts that occur. As long as there is thinking it has no rest. The less work, the less mental stress. To stop the mind is the greatest consolation. So try to tranquil your mind with some kind of meditation. If one meditates for one hour a day, one can make the best use of the other 23 hours with calmed mind. The more time one devotes for meditation, the more one strengthens the faculties. Devote your time to do something useful. Never lumber and waste your time daydreaming. Do not get unnecessarily ready for anything. Use your mindfulness and wisdom together. Your will never go wrong if you do so. Never leave a patch of work neglected and undone. You may have to lament over what you miss. Time and opportunity once lost cannot be regained. Life is time itself. Therefore preserve your life and time always for good achievements. When resting your physical body keep mindfulness awake and avoid disaster. All worries spring up in your mind. Wicked words and wicked deeds spring up in the mind. If one deeps the mind purified, the whole life is enlightened. The fool who knows his foolishness is wise at least to that extent. But a fool who considers himself wise is indeed a fool. Ill done is that action which brings regret and repentance, to cause suffering for one self and a weeping and tearful face. Well done is that action which one repents not later, but bring joy and fulfilment, happiness and delight. There is a path that leads to worldly gain, the road that leads to deliverance is another. So be wise and take the path to wisdom and Enlightenment. Never hesitate to do good. Even when there are obstacles, overcome them and do the best that will bring you satisfaction and consolation in the eve of your life. It is not possible to gain relief without at least a little pain. Knowing this, always strive to do the best. Face obstacles with courage. If your perseverance is weak you will never succeed. To live wisely the aim should be noble. So always stride the noble eightfold path end win. Learn to face both loss and gain with equanimity. Learn from past mistakes and strive harder. You will always be a winner at the end. Everyone who seeks mental satisfaction should be able to choose the good from the bad, the possible from the impossible and the appropriate thing to do. Always think before you leap. We have two paths to tread. The pleasurable path and the good Noble path. Carefully choose the Noble one. If you are selfish, you do not deserve consolation. Only an unselfish person can gain satisfaction and relief. So strive to make others happy and content. If you miss this opportunity to be so now you will miss a great chance, that will keep you repenting in gloom. Your service to others should never be for fame and praise from others. A relief you do for another, can adorn your memory for ever. Most people in your society get into difficulties with impossible aspirations and hopes. So do not try to imitate a neighbour who has means and facilities. Be content with what you have . Don't run after fashions and entertainment which you cannot afford. What use is there of fashions in this ever changing world? Most people are misguided by advertisements. It is a trick of the trade to promote sale. Be wise in using your resources for the welfare and benefit of your family. Happily indeed we live, friendly amidst the hostile, non-afflicted away from those afflicted by craving, free from avarice amidst the avaricious. Happily indeed we live, we who posses nothing. Craving for possessions and mental relief do not go together. They are two extremes. So the choice is yours. Select only what is very necessary. Try to be satisfied with little. Accumulation always bring pain and trouble. Most people suffer not because they have no wisdom. It is because they do not make use of the wisdom properly. So try to change to this new Course. Leave out all unnecessary possessions. Start what is very necessary and those that are undone. If you are wise this way you can have relief. Faith has to be applied, love associated, trained in mindfulness, make giving a part of life, develop devotion. All these good acts cannot be mastered at once. Train slowly and make them ornaments in your life. Mental relief is the result of good character. It has to be achieved through mental purification. One cannot obtain relief by keeping the mind polluted. There are factors that support mental purification and others that go against it. One's food, dress, associates, environment and habits should all be in accordance. Pilgrimages enhance faith, offering and rituals too are helpful. In order to get quick results, one has to practice them constantly. If you are one who harbours anger towards the others, one who ill treats the servants and workers, punishes children harshly, tough with your married partner, cheating others in daily business, don't expect mental relief in return. You do not deserve such benefit, if you wish to get mental relief in return, make others happy and hail first. When you are distressed and agitated by some kind of adversity, broken fortune misfortune refer to the Dhammapada for relief. Meet friendly monks, seek company good friends, go on pilgrimage, and forget your worries. Stay for a few days in some holy city. Change your environment, to for walks. These will help you to gain your lost courage and strength. Never get to the habit of using drugs and liquor when you are in distress. It will be like making a new wound to heal an old one. The remedy will be worse than the disease. Sleeping tablets cannot help situations. If taken you will lose the vigour and strength that is vital to face life's situations. Be endowed with internal purity noble qualities, kindness, welfare of others, that enrich your character. Make them your store of wealth. Let them also be accumulated by your children. Rid your passions and lust. Enhance noble achievements. Purify your deed, word and thought and get enriched in morality. Be honest. Dishonesty is the most harmful enemy one can have. By comparing your self with those who are your lower and matching against the noble saints who are above you, follow the higher path and enhance your progress. Stick to the golden rule "silence is golden" Talk less. If you talk, say some thing better than gold. Do not go to argue. You will never win. It will create an enemy, winning will swell your pride, which will defeat you at the end. Respect the ideas of others. Do not go to criticize. Be a listener to others opinions. Forget the past. Don't have hopes in the future. Live in the present and face facts and responsibilities as they come up. Don't expect that anybody in the world would help you or come to your aid and assistance. Think there is no one in the world to help and guide you, except the Buddha and his teaching. One truly is the protector of oneself; who else could the protector be ? With oneself fully controlled, one gains the mastery that is hard to get. As a diamond cuts a softer gem so does the evil committed by a fool, crush the doer. Whoever moves from carelessness to mindfulness, from ignorance to wisdom, lights up the world like the moon emerges from a cloud. Avoid all evil, cultivate good. Purify your mind, this is the teaching of all Buddhas, to gain peace and relief.